Back in 2002 John Peel had a shed which, you will not be surprised to read, was full of records. He needed to empty this shed so he launched a competition in which 10 winners would get around 200-250 records each from the shed. The compo was to describe his radio programme in 20 words or less, for use in a possible Sony Award nomination. In his show broadcast on 17th January 2002, Peel announced the winners and one of them was John Osborne. The winning and the receiving of all these records inspired John to go on and write a book, record his own radio broadcast and eventually perform in a show with a live tour. Let’s start with the book : Radio Head: Up and Down the Dial of British Radio which was published in 2009. And you can grab via that Amazon link for a seriously low price (no affiliates or anything, just buy the book). 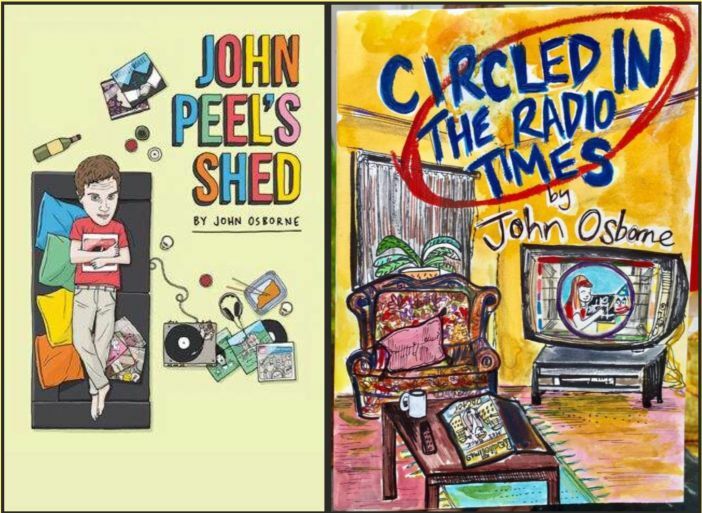 The book starts with John (Osborne’s) memories of listening to Radio 1 and John (Peel). From here he goes on tangents of listening to other radio presenters and radio stations. Noting down his own observations and of those from these broadcasts. John’s anecdotes and humorous and warm. As I said, buy the book. John eventually did something with the records and in 2010 he approached a local community radio station near him – Future Radio and talked to them about making his own radio show. From that came a five episode broadcast which he called John Peel’s Shed. In his shows John plays some of his favourite tracks and highlights others, telling the stories behind some of the recording artists and songs. You can also find it on YouTube here. John went on tour with that show and is back out again (early 2019). It’s a double show: John Peel’s Shed and then: Circled In The Radio Times. You can find the dates and venues here. Back to those Future Radio broadcasts – They went out on 2010 and were also made available to download as podcast episodes. But sadly the Future Radio website was updated and they were not available any more. Luckily John uploaded them to Podomatic – but another but here: sadly episode 4 went missing. 15. Dusted – Always remember to honour and respect your mother. 15. Raz Ohara – Far’s song. 1. Walter Ghoul and his Lavender Brigade – Frumpy and the strange machine. 6. Michael Sheehey – The Licensing Song. 7. The Now Time Delegation – Little Miss Fortune. 16. Screaming Lord Sutch – Scream and Scream. Thank you John (Peel, of course) and to you John (Osborne) for creating these great shows. Again thanks to Keith Jackson for the invaluable help.